Children are becoming hunchbacks due to the long hours they spend huddled over smartphones, tablets and laptops. This is having serious health repercussions, with young children developing spinal problems. 'Text neck' is causing severe damage to the necks and backs of children worldwide. 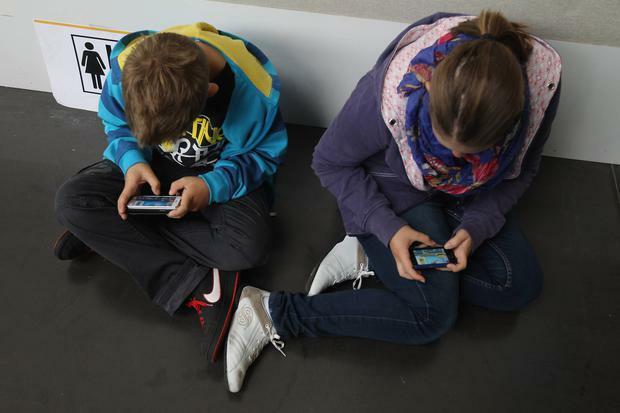 Children as young as seven are developing hunchbacks and curved spines because of the amount of time they are spending bent over phones and tablets. Back and neck specialists claim increasing numbers of young people are suffering pain from too much time stooped over phones, computers and tablets. Research suggests that smartphone users spend an average of three hours a day hunched over their devices. This adds up to a whopping 1,460 hours a year. Our spines and the spines of our children are being put under severe pressure. Dr James Carter, one of Australia's leading chiropractors, says that the number of people with 'text neck' has more than doubled over the past year. According to Dr Carter, the spine can shift by up to 4cm if the head is repeatedly tilted downwards. Patients are going to their GPs complaining of headaches, not realising that the problem lies in the hours they spend bent over electronic devices. A heel-to-toe test will diagnose the problem instantly. You simply ask a child to bend over and touch their toes, making an 'n' shape. Those with curvature of the spine won't be able to flex enough in the middle to touch their toes. They'll stumble or fall over. Carter says the 'text neck' condition can also result in emotional and behavioural changes. "Resting your chin on your chest to look at your phone stretches the spinal cord and brain stem. This can affect respiration, heart rate and blood pressure." The weight of our heads on our necks can double when our heads are bent at a 15-degree angle and increase to five times at a 60-degree angle, putting huge pressure on the neck and spine. This pressure can also prevent the release of endorphins and serotonin, commonly known as our 'happy hormones'. But the problems with neck and spine are not solely down to electronic devices. Part of the issue stems from the fact that children today lead a much more sedentary lifestyle. If a child doesn't do any exercise and stays in a static position playing computer games for hours on end, it's no wonder they end up with back problems. Children are now more sedentary than ever before, especially from the age of 11 onwards. Parents need to encourage them to get out and play sports and when they do use tablets or phones, they should raise them to eye level and avoid any neck bending. A good way for children to counter neck and spine pain is by lying on their front and propping themselves up on their elbows. Research also shows that light from screens can affect the quality of a child's sleep, as well as their capability to dream. It is advisable for all children to switch off devices for an hour or two before bedtime. The curvature of the spine and neck pain is not, in fact, a new phenomenon. Two years ago, two Dutch orthopaedic surgeons flagged up back problems caused by hunching over game consoles and iPads, they called it 'Gameboy back'. Surgeons Piet van Loon and Andre Soeterbroek said that the last time curvature of the spine and herniated discs were seen in children and teenagers was more than 100 years ago, when child labour was still relatively common in Europe. "In those days, kids got weak backs from child labour; now they're getting it from these devices," said Soeterbroek. "It makes no difference to the body whether you're hunched over in a cigar factory or spending eight hours over an iPad." No one is suggesting that the problem lies with the devices and banning them is certainly not the answer. The issue is the amount of time that children spend on them and their posture while using them. We used to worry about our children's backs being crippled by the weight of 50 books stuffed into a school bag that was then strapped to their backs. They looked like turtles going to school, bent double under the weight of the school books. The introduction of tablets to schools was a Godsend. Our little darlings could skip home unburdened by weighty bags. Problem solved…or so we thought. With more schools ditching textbooks and using tablets in the classroom, the problem of posture needs to be addressed in schools around the country. If a teenager is going to spend six hours a day in school hunched over a tablet, they need to be told how to sit straight and have the tablet at eye level. If we don't want to end up with a generation of Quasimodos, we need to act now. Kevin Doyle Can a demonstration be described as 'peaceful' if it represents everything that goes against peace?